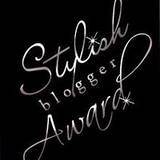 Mama's Thinking Corner: Stylish Blogger Award! I was awarded a special blog award! I don't know if I really deserve it, but it was a sweet warm fuzzy after a long day. Thank you Julie for awarding me with the Stylish Blogger Award. I met Julie through the blog world when she commented on one of my posts. I like to learn about the people who read my blog. So I went to her blog. My world has been uplifted many times while reading Julie's blog. She is a busy mother of 7 kids, she is working towards her bachelors degree, and she was a Mother of the Year nominee for Oregon's Mother of the Year. She has a lot of great advise and adventures to share! Thanks again Julie! 2. Tell your readers 7 things about yourself. 3 Award 15ish bloggers (if you read that many blogs;) whom you feel deserve the award. 1. So far the hardest thing I've faced is the death of my twins. 2. I really really like chocolate! 3. I was a professional nanny for 10 years. I nannied in Boston, Hawaii, Chicago, and Utah. 4. I met my husband in Hawaii. 5. My husband and I created and ran a national Nanny Agency. 6. I am educated (not certified) to be a Holistic Health Practitioner from Global College of Natural Medicine. 7. I served a mission in Chicago for my church, The Church of Jesus Christ of Latter Day Saints. I will nominate two women for this award. I love all of my fellow mommy bloggers and I think many of them deserve an award. However, several of them actually have private blogs or their blog is just meant for their personal family and friends. So I won't "officially" nominate them. But I'm sure grateful for them and their willingness to share their world with me through their blogs. Brittany authors Que and Brittany's Adoption Journal. She brings hope to many people through her blog. Brittany and her husband have adopted their first son and her blog shares this amazing journey with all of her readers. She and her husband have opened up their life and adoption story to the world and I admire her wisdom and courage. She is a great writer and I can't help but feel uplifted any time that I visit her blog. Thanks Brittany! Stephanie authors A Daily Scoop. Stephanie lost one of her little girls in a drowning accident. Stephanie shows strength and wisdom daily, as well as the raw and painful reality of the loss of a loved one on her blog. She share the light that Jesus Christ's atonement can bring during some very dark moments on this earth. Thank you Stephanie for sharing your journey and faith with us! I officially nominate Brittany and Stephanie for the Stylish Blogger Award! Visit them, you won't regret it! Don't forget to grab your award ladies. Oh Lena, you're SO nice! Thank you so much! !